You will be creating a Mission Lap Folder. It's a major part of your Social Studies grade. 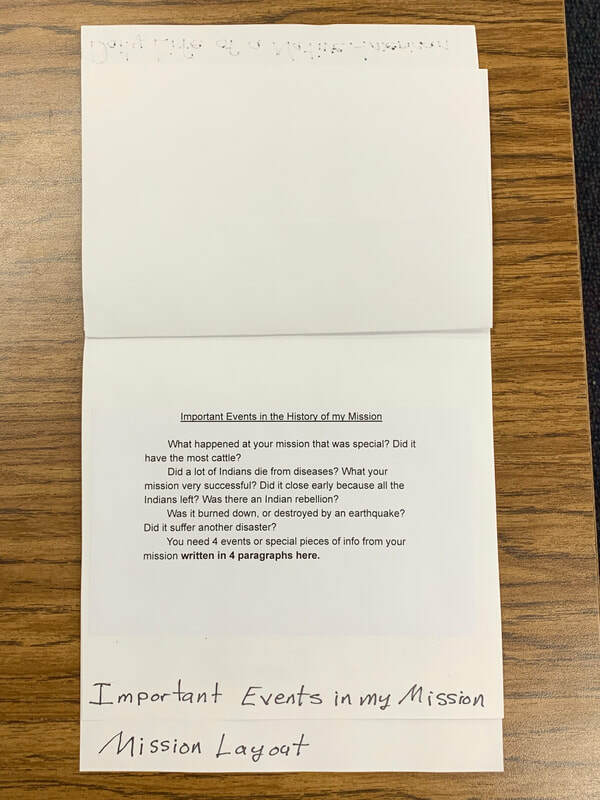 You will need to research and write about your mission. The final project will be completed primarily in class. It’s your job to do the research, and take notes. 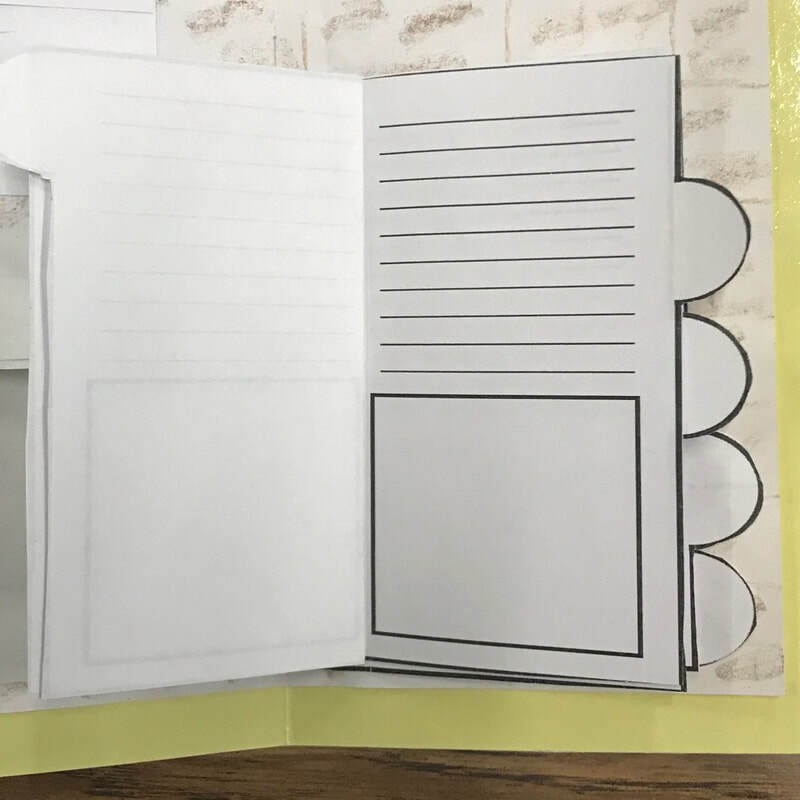 You will be assigned draft/final paragraphs and folder components in class. It’s important that you keep up with the assigned tasks! Finish the project on time. Every day the project is late loses 5 points. If you lost your paperwork for this project, you'll need to print up another copy at home. A link to the paperwork is here. 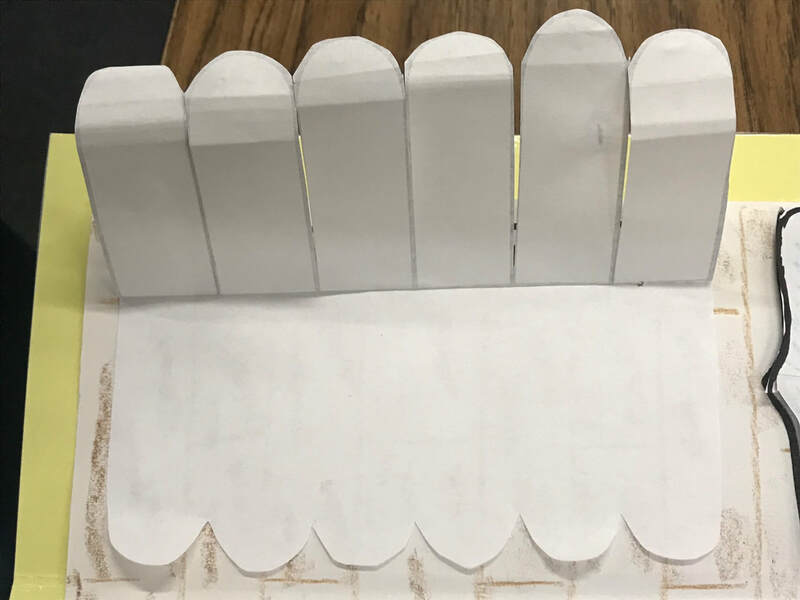 Here's what the final project will look like. 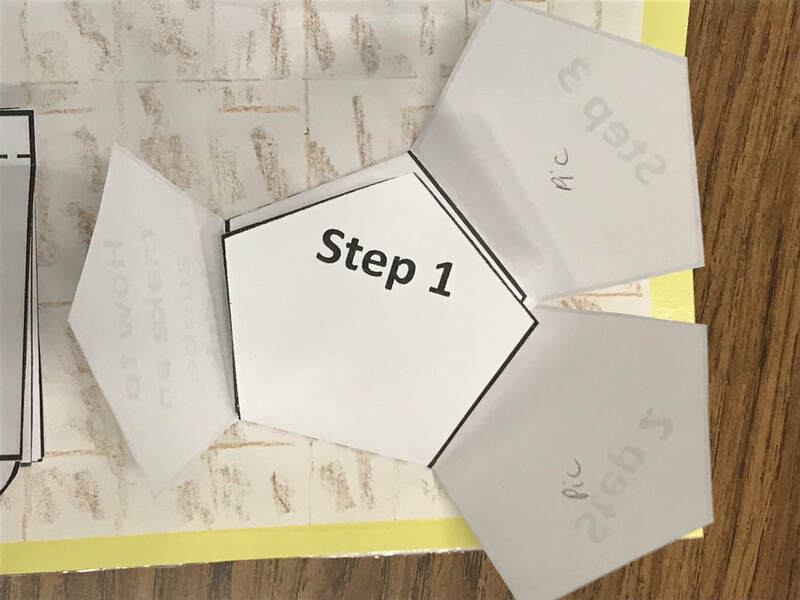 Do your best, 4th grade quality work! ​Neatly drawn and colored cover - Demonstrate effort and creativity. Includes mission name and your name. 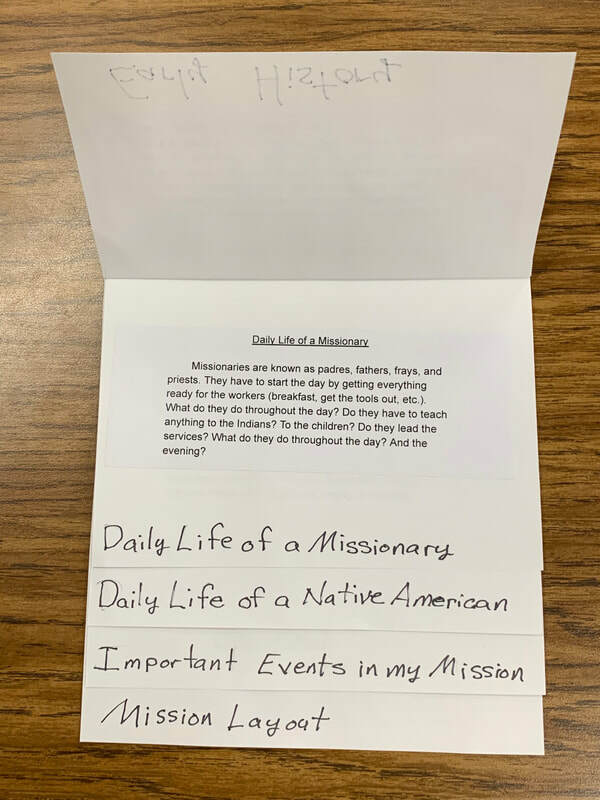 What was a typical schedule for a friar/missionary? 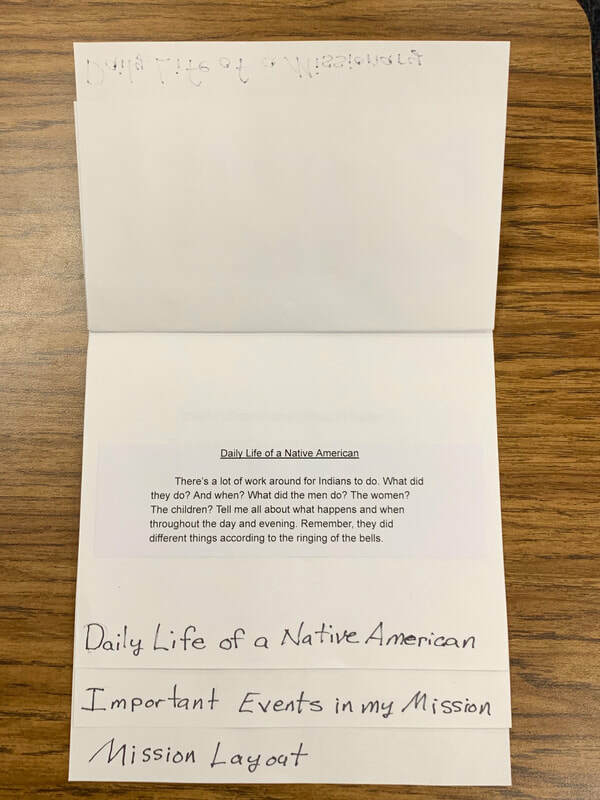 What was typical schedule for a Native American? Identify and research 4 important events and or interesting facts in your mission’s history. Write a brief explanation/paragraph and illustrate each event. ​Layout of Mission: 10 pts. 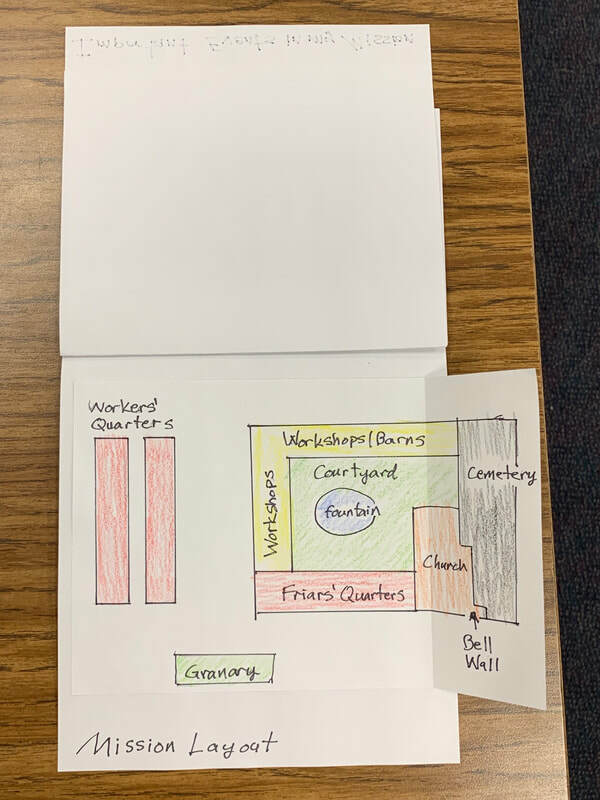 Draw and color a detailed map of your mission. Include surrounding areas that were important to your mission’s daily work. Label and include any necessary captions. A reminder of what's needed in each section can be found here. The progress of the mission building. Ask for any supplies that you need and why you need them. Any problems that might be occurring at your mission. Research the daily bell schedule of your assigned mission. Starting with when the mission bells ring to wake everyone. Ending with when the mission rings signaling when it’s bedtime. Include at least 8 different times (in order) that the bells ring and the activity they signify. You will choose 6 mission vocabulary words. A list of mission vocabulary can be found here. Write a definition and include a small illustration. Research 5 architectural features on a mission. A list of architectural features can be found here. Describe each feature and its purpose. You will be including a colored illustration of each. Research how the early Californians made adobe bricks. 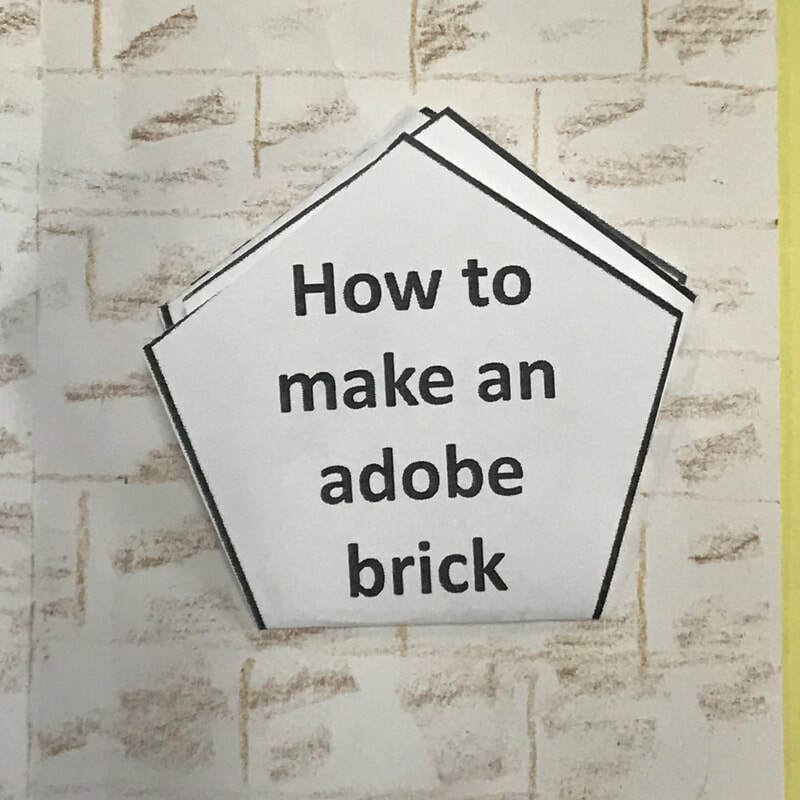 Write out 4 steps to make an adobe brick. Be sure to include enough details to successfully make a brick. Neatness, creativity and organization counts! 5 pts. Maintain organized notes. Please do NOT lose your directions and notes. Includes grammar, spelling, and punctuation. 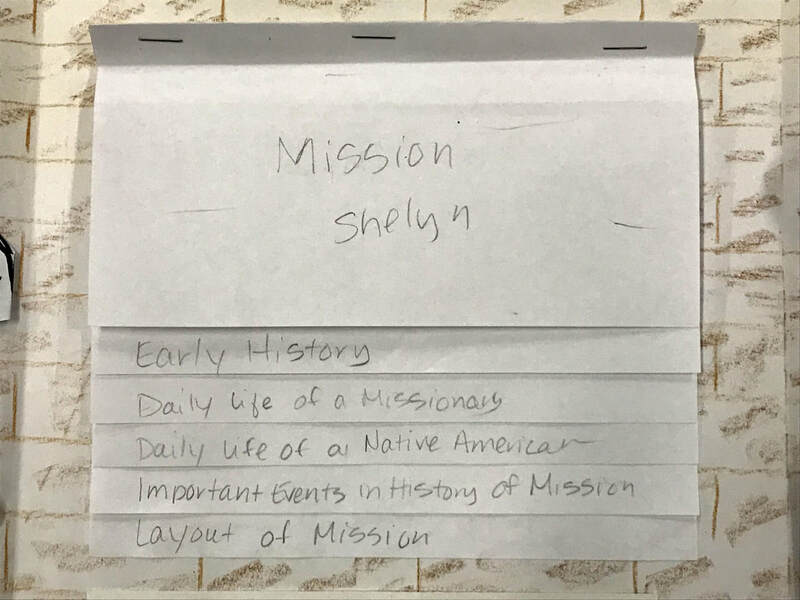 Your child's assigned mission is listed here by their class number. For general information on the entire mission system, see this page. The CA Missions Resource Center: a state website with lots of details on each mission. ​Be sure to click on "Key Facts by Missions" on the top left side. Click here to see a map of where all the missions are located; click on the mission on the map for more information. FactCards: There are lots of informational links here, specific to each mission, and info on general mission life. ​CA Parks mission info: this link might have some quick trivia to make your report more interesting... check it out! Here's another link with mission information called Mission Tour.org. Check it out... there are lots of pages (with pictures) at the bottom of each page. 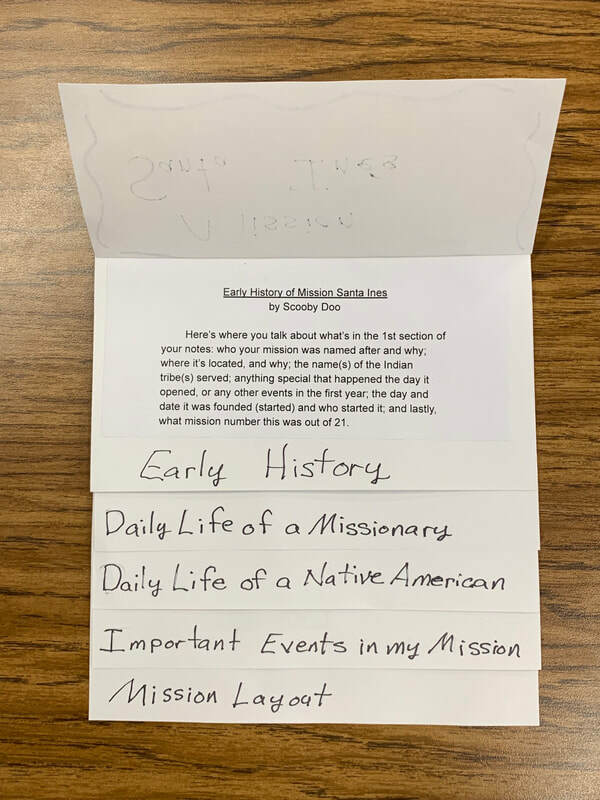 CA Missions Trail: Basic paragraphs on each mission can be found here. "21 Missions" can be found by clicking here. There are some NICE photos here to use to draw your cover. Click on the name of your chosen mission for photos and info. 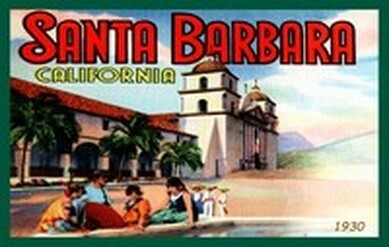 California Missions.org: easy listings of missions. CA Missions Foundation: Click on the seal with the name of your mission. KidPort Mission information: Another place for info you might be missing. Click on the mission name further down the page. SOME (not all) CA Missions: This web page has some missions listed near the bottom. Is one of them yours? 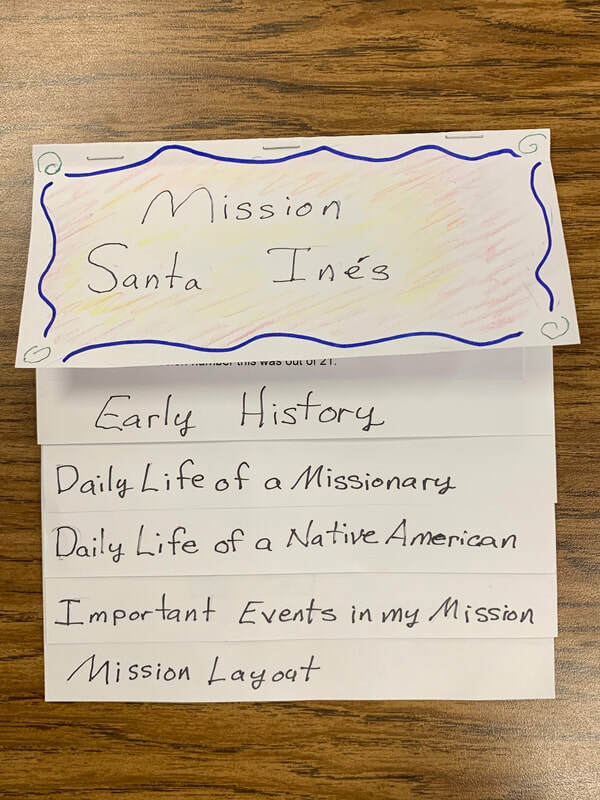 Visit this site and put in the name of your mission in the SEARCH box (like "mission san gabriel"). You'll find original photos of your mission from over 100 years ago. You'll also find MANY of the missions with original photos and artwork by clicking here; scroll down the page to see the mission names on the right. For information on President Lincoln's help with turning California's missions back over to the Catholic church, visit this link (courtesy of Mission SJC). Click here to read an article in the Orange County Register. 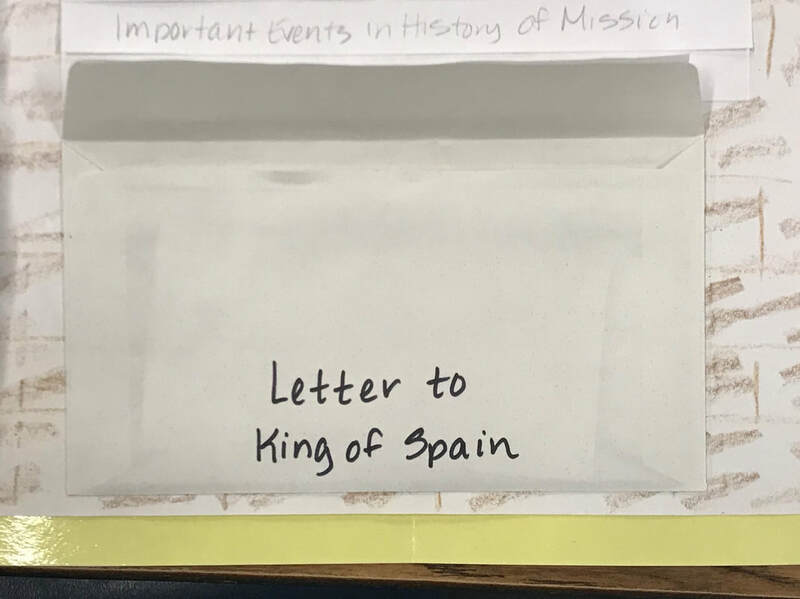 Info on the San Diego de Alcala mission is here. Click here to see an article talking about Mission San Luis Rey de Francia and President Lincoln. Need some info on Father Junipero Serra? Click here to learn more about this important person from California's past. CA Mission Overview: Here's a quick music video touring all 21 missions. Watching this may help you decide which one you'd like to report on. Click here to see a video from Chapman University (starring Huell Howser from California's Gold) as he visits San Gabriel de Arcangel, San Fernando Rey de Espana, and San Buenaventura. ﻿Click here to see another Huell Howser video with a traveling mission exhibit﻿. Here's another video on mission art, housed at the Huntington Library. Here's one on the Santa Cruz Indians, with lots of great general information that applies to Indians throughout CA. Notes taken in a previous class are shown below.